Welcome to Restaurant Malý Svět in Litomyšl, Czech Republic. There are several good restaurants in the area between the chateau and the main square and Restaurant Malý Svět (Small world) is one of them. 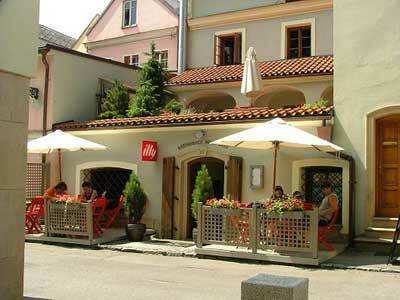 It’s one of Litomyšl’s newer restaurants and despite the slightly high prices it seems to be popular with the locals. I asked a few different people for restaurant recommendations and their answers all included Malý Svět. True to the name, Malý Svět is small. There’s just one dining room and a couple of extra small tables are squeezed into nooks leading off the corridor. The first time I tried to eat there I couldn’t get a seat. Returning in the summer though, it was much easier. There were several tables set up on the footpath out front and another two across the street beside the small fountain a fish pond. We were a group of six so we opted for the large table by the fountain and settled back to watch the fun that a couple of the locals were having trying to fish coins out of the pond with a magnet tied to a piece of string. The waiter was with us quickly to leave us the menus and take our drink orders. The menu ostensibly includes dishes from across the world, but Italy seems to have more than its fair share of emphasis. The prices are a little higher than you might be used to in comparable Czech towns, for example Chicken Risotto was 118Kč, Turkey salad was 136Kč and the Linguine was 140Kč. 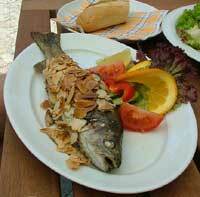 The best value on the menu seemed to be the trout in almonds, which was 131Kč, and therefore less than some of the pastas. All of the food was excellent, including the garlic bread (20Kč) that we shared as a starter and the coffee (28Kč-espresso, 33Kč cappuccino) that some of us had afterwards. 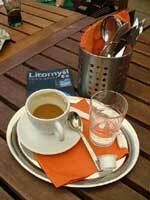 The service was also very good, perhaps because our waiter was also the owner of the restaurant. He explained to us that they sometimes cook on the grill in the outdoor area that they are often so busy that they have to turn people away. Malý Svět is open from 10.30am to 10.30pm seven days a week and if you want to make a reservation, they can be contacted by telephone on (+420) 777 293 203, or by email at olivajan@seznam.cz. If saving a few crowns on your meals is not your highest priority, then the big tastes of the small world are among your best options in Litomyšl.